In the northeastern section of Metro Vancouver, nestled between the Golden Ears Mountains and the Fraser River, you will find the remarkable City of Maple Ridge. Maple Ridge has an ideal location on Highway 7, just ten minutes north of the Trans Canada Highway. This splendid location affords residents quick and convenient access to the all of the Fraser Valley, Interior British Columbia and Vancouver. Additionally, Maple Ridge neighbours the wonderful communities of Langley, Mission and Pitt Meadows. More accessible than ever, Maple Ridge has benefitted from the many improved bridge connections to the Fraser Valley and Metro Vancouver. 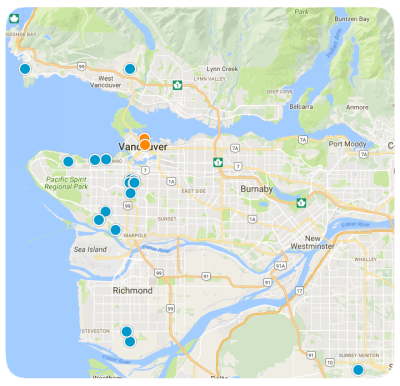 The city is also less than one hour from both the Vancouver International Airport and Abbotsford International Airport. All of these great features make Maple Ridge a fabulous place to live. Offering a perfect blend of rural and urban life, Maple Ridge is increasingly popular, yet has relatively affordable home prices. Buy a home in Maple Ridge and enjoy a long list of impressive amenities, including a multitude of opportunities for outdoor recreation. Most homes within this spectacular city are within fifteen minutes or less from parks, trails and pedestrian friendly dykes. Additionally, the city serves as the gateway to Golden Ears Provincial Park. Residents also enjoy great options for dining, entertainment and shopping, as well as an array of family-friendly events and festivals hosted by the city throughout the year. Furthermore, Maple Ridge has excellent schools with students served by the Maple Ridge-Pitt Meadows School District. The area also boasts top-notch medical facilities, including Ridge Meadows Hospital. With all of these great amenities and features, Maple Ridge is a must-consider destination for homebuyers looking to relocate in Metro Vancouver. The city has some of the most affordable homes, which include single-family detached houses, as well as some row houses and low-rise apartments. Homes in Maple Ridge are found in a number of truly beautiful neighbourhoods, each with its own list of amenities and special features. Maple Ridge neighbourhoods include Albion, Cottonwood, East Central, North Maple Ridge, Northeast, Northwest, Silver Valley, Southwest, Thornhill, Websters Corner, West Central and Whonnock. If you would like more information about any of these Maple Ridge neighbourhoods or the homes for sale in any specific community, please do not hesitate to contact us today. Courtesy of Park Georgia Realty Ltd. Listing courtesy of Park Georgia Realty Ltd.